It was all fun and games at the G20 Summit in Australia—until somebody accidentally leaked highly personal details of the world's most powerful leaders—including the names, passport numbers, birth dates, and visa details of everyone from Barack Obama to Vladimir Putin. The cause of the leak? Microsoft Outlook's autofill. Just to be safe, the officer says that the recipient of the leaked email—a member of the local organizing committee of the Asian Cup—deleted the email and "emptied their deleted items folder." Case closed! Not so fast. Australia's government has been under fire recently for passing controversial data retention legislation, so officials hiding an incident like this doesn't look good for transparency. Furthermore, when you leak the passport numbers of folks like Angela Merkel, Xi Jinping, Shinzo Abe, and David Cameron, you can't expect nobody to find out. 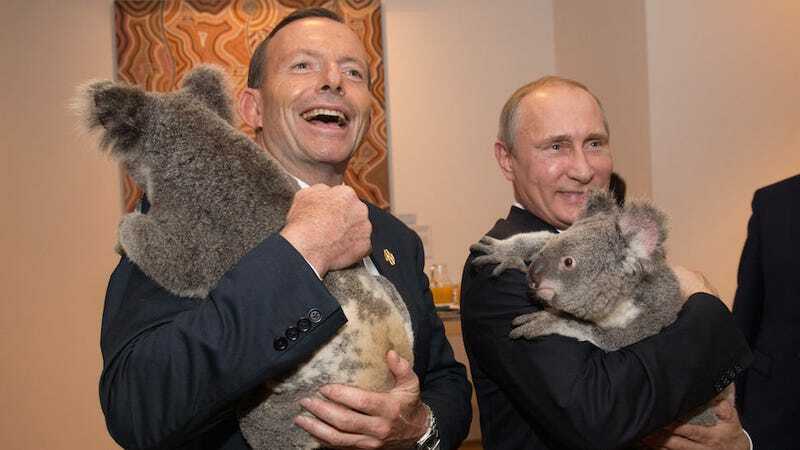 Those viral photos of Putin holding a koala can only distract people for so long.